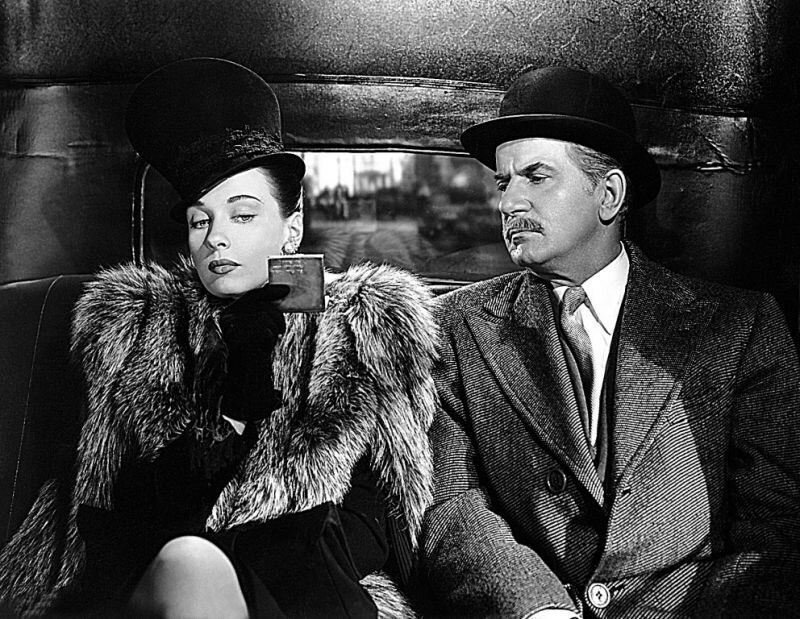 Dressed to Kill, released in 1946, also known as Prelude to Murder (working title) and Sherlock Holmes and the Secret Code in the United Kingdom, is the last of fourteen films starring Basil Rathbone as Sherlock Holmes and Nigel Bruce as Doctor Watson. A convicted thief in Dartmoor prison (played by an uncredited Cyril Delevanti) hides the location of stolen Bank of England printing plates inside three music boxes (each of which plays a subtly different version of “The Swagman”). The boxes are sold at a local auction house. A criminal gang’s brains belong to a darkly beautiful, ruthless woman, who is also a “consummate actress”, as Holmes learns. She disguises herself as a charwoman and speaking Cockney, insults and berates both Holmes and Watson, whom she pretends not to recognize, and leaves with a music box right under their noses. Holmes must recover the last music box to crack the secret code contained in the tune before it is too late.